Get ready for spring with a 5K run/walk, 9K run and 1-mile kids fun run! Get some exercise and have a great time at the Spring Training 5K/9K and 1 mile kids run. Online registration ends April 6th! After that date, you can register in person during packet pickup Thursday or Friday, or race day from 7-7:30 a.m. The Spring Training 5K/9K Run will take place Saturday, April 9, 2016 at Highlands School in LaGrange, IL (near the intersection of I-294 and I-55) starting at 8 a.m.
It’s a great way to kick off your spring training! Get a great workout and then enjoy a sports costume contest, hot dogs and Cracker Jack! Check out our Facebook page. Packet pickup is at The Runner’s Soul on Thursday, April 7th and Friday, April 8th from 10 a.m. to 7 p.m. Proceeds from the Spring Training 5K/9K race go to District 106 Educational Foundation, celebrating 20 years of enrichment. Sponsored by The Runner's Soul and Cafe Salsa. See more sponsors here. The 9k route is the same as the 5k route for the first 5k and then loops twice through the area again, each loop being 2k, for a total of 9k running distance with the 7k spot being right at the park behind the school. 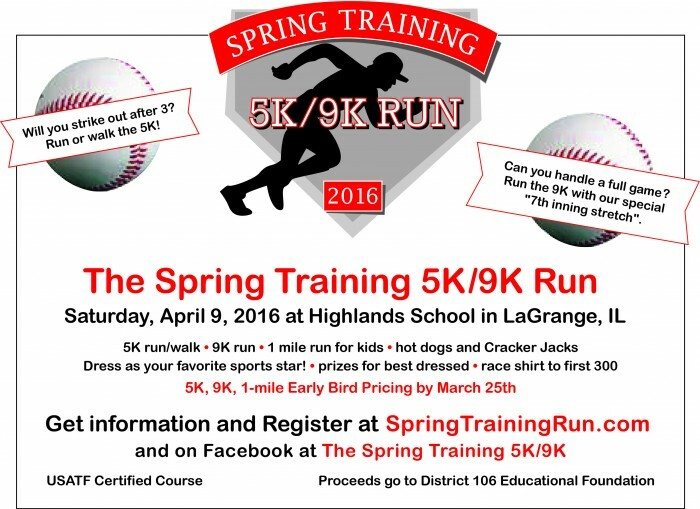 The Spring Training 5K/9K Run will take place Saturday, April 9, 2016 at Highlands School in LaGrange, IL. It’s a great way to kick off your spring training! Get a great workout and then enjoy a sports costume contest, race awards, hot dogs and Cracker Jack!